It seems like a never-ending balancing act to give your kids foods that excite them while keeping it healthy and that’s why free2b is perfect for kids. 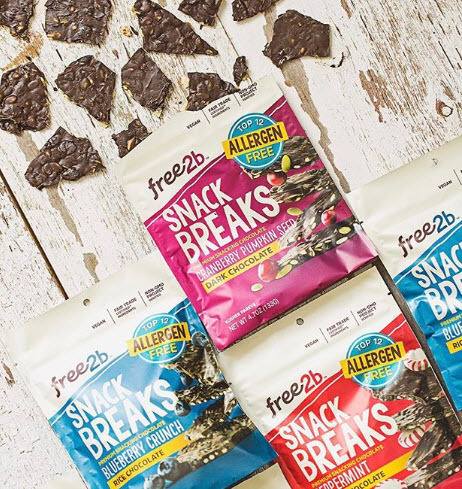 With fre2B snacks, your kids can choose from Sun Cups or Snack Breaks in delicious varieties such as dark chocolate cranberry pumpkin seed, dark chocolate peppermint, or chocolate blueberry crunch as well as much much more! Our favourite is the dark chocolate peppermint. The best part about free2b snacks is that they are allergen free (top twelve allergens)! Safe for school and with superfood inclusions these delicious snacks are healthy! Snackable and shareable, they’re the perfect addition to your kid’s lunches. Check out their recipe page for some delicious eats! Free2b started with one Dad who wanted his peanut-allergic son to taste a chocolate candy cup. You know when a company starts out of a family that there is love and care put into their products. It’s also super important to be teaching our kids to be environmentally conscious which is what free2b does as a NON-GMO project. Free2b snacks are available at Shoppers Drugmart locations, and they retail for $7.99 – $9.99. Have you tried free2b? Tell us what you think in the comment section below.